You aren’t alone if you suffer from bad breath: 65 percent of all U.S. citizens suffer from the problem, even if it is only occasional. Of that number, however, about 40 million consistently have bad breath. Whatever the frequency, 90 percent of all bad breath originates in the mouth and is not caused by some other health problem elsewhere in the body. Spending money on an over-the-counter product usually just masks the problem instead of curing it, meaning that the billion dollars spent every year on such products is wasted money. For most people, the answer is food particles and the bacteria that feeds off those particles, releasing a sulfur compound in the process. Of course, some specific foods like garlic and onion are also notorious for their effect on your breath. Gum disease, fasting, and too little saliva can make your breath stink. In addition to the well-known health problems caused by tobacco, tobacco products are another significant source of bad breath. Sometimes bad breath is an indicator for a serious illness, such as diabetes. Sometimes it is a side-effect of medications you are taking. The first step in stopping bad breath is improved oral care: brush your teeth and your tongue, floss, use mouthwash, and go in to see the dentist regularly for a professional cleaning of your teeth. Be sure to select a mouthwash that kills germs. 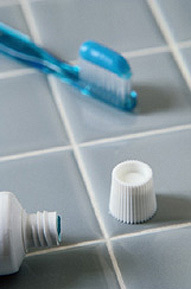 Improved oral hygiene may be enough to solve the problem. If it isn’t, you and your dentist need to do some analysis of the foods you eat, the medications you take, and possible causes such as periodontal disease or dentures that are not clean enough. Once you’ve eliminated all the possible causes that are related to dentistry, the next step is to see a medical doctor and continue the analysis, this time looking for systemic illness.